What Is The Best Portable Horse Corral? Do you ever travel with your horse? Do you spend the weekend at horse shows or hitting the trails? Wish you could allow your horse to stretch his legs in more than a stall or tied to your trailer? If you answered yes to any of these questions, then you may want to get a portable horse corral for your horses. You can jump straight to our recommendations by clicking on any of the links in the quick navigation or read on for the buying guide. How do I know which portable horse corral is right for my horse? Whether you’re taking your horse to a show, on a camping trip, or rotating the grazing space in your pasture, you will likely find yourself in need of a portable horse corral. But how do you decide which corral is best for you and your horse? There are many different factors to consider when looking at portable corrals. Do you need it to attach to your trailer? Will you be putting up or taking down the corral by yourself, or are you likely to have help? All of these factors and more will play into your decision about which horse corral to get. You also need to factor in overall cost to build and maintain as well as what suits your horse. If you have a horse that is liable to shift around a metal or plastic corral will work, or maybe an electric netting fence is the way to go. If your horse isn’t bothered by electricity, you may need to go with metal or plastic. And if your horse is particularly rowdy, you may want a plastic corral that can have electrified netting added to it. Is it safe to keep my horse in a portable corral? But it is very important that you choose a model that is made for you and your horse's circumstances. It’s also important to consider what safety features each corral has, as we all know how horses can be spooked by the smallest of things. Nobody wants to see their beloved horse be injured by the very thing that is intended to keep them safe. We have reviewed proven options that should fit what you are looking for. Do you need a portable corral but hate dragging around heavy panels that are up to 6 feet long? Don’t have much room in your trailer for large panels? The Premier Horse QuikFence 4/28/24 is just what you’re looking for. The 50-foot electric netting fence is a very affordable portable fencing option. This doesn’t include an energizer or extra support poles to put up anything other than a curve or straight line, so you’ll need to factor those costs into your budget. One note, you need to make sure the energizer you provide uses only low or wide impedance intermittent pulse. Continuous current energizers are a fire risk. While a fully charged battery can last for several days, you can also purchase a 12-volt DC fence charger that includes a small solar panel. ¾” diameter posts with double-spiked feet are spaced every 12.5’ on the 4’ tall fence. Vertical plastic breakaways are spaced every 2 feet for the safety of a horse that tries to break through. Willful horses may break through without too much trouble. This is a great choice for those who travel a lot with their horse. If you’re looking for something a little bit sturdier than an electric fence model, the Apple Picker Portable Travel Corral is exactly what you are looking for. Four 12-foot-long panels that are made of 19 gauge, steel fabricated (powder coated), 1 and 3/8" tubing fold in half to be more portable. Each panel weighs 29 pounds. Creates a 12’X12’ stall. A very sturdy corral that while heavy, has panels that fold to make take down and transport easier. This corral will travel well and last you a long time. This corral is perfect for the quiet horse who needs to stretch his legs during that weekend camping trip. If you prefer to DIY, the Standard Portable Corral Box Set allows you to put together your own portable corral that can be set up or taken down in just minutes. The 6’ long and 4’ tall panels are made of lightweight PVC and only weigh around 8 pounds each. One set makes a 12’X12’ or 15’ round pen. There are no sharp or rigid edges, and quick-release elastic connectors prevent horses from getting stuck. 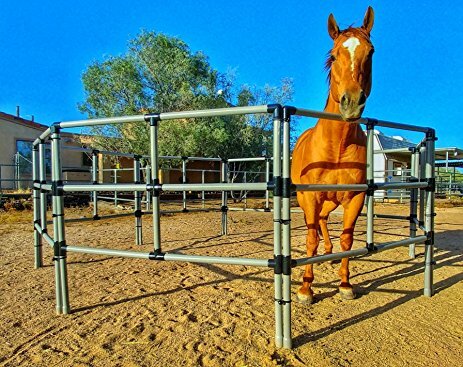 Rest comfortably with your horse in this sturdy three rail corral system. The EconoLine Portable Horse Corral Box Set is smaller than its Standard-sized cousin, with each panel only being 5’ long to create a 10’X10’ pen (or 10’X15’ if you use the side of the trailer) or a 12’ round pen. The smaller panels are only 7 pounds each. This set has all the same features as the Standard apart from the smaller size. Portable horse corrals are safe, affordable, and great to have when taking your horse on the road. When purchasing any corral it is very important to look what will be the best fit for you and your horse's needs. Did we miss any great options? Let us know in the comments.